So take a look at my pick of the latest L.A. Colors’ Color Craze 2012 collection. Front left to right: Flurry, Edgy and Animated. Back left to right: Cobalt, In a flash, Aquatic and Sea Foam. Animated: Is an awesome semi jelly red which has a slight shimmer to it too. Sadly you can barely see it in photos. Edgy: Looked like an awesome purple creme but…. Ugh! It is awful! Nice enough colour, a little bit meh, but awful to get on the nail, nasty to take photos of and it took three coats to get it semi opaque. It is a stunner on, easy to get on the nails and dries nice and quick. HOWEVER it stained my nails a little bit :s Though I’m willing to look past that. In A Flash: Another blue creme this time just darker. Love it on my nails! It can be a bit streaky and takes three layers to get opaque, but it does dry very quickly. Cobalt: A shimmer, glittery blue polish. This was the first one I picked out for myself. I love the glittery effect of this polish without being overloaded with chunky glitter. I don’t know what type of finish you would call this, but I really like it. Flurry: Those of you who know me well enough will be sitting there going, “MaSucree that’s a glitter!”. But it looked lovely in the bottle. It reminds me of snow or stars, and is very small. I think that is why I like this glitter, it’s not big and chunky like other ones. Now take a look at it over other polishes. Over Take a Hint (you can see the blue staining 😦 ). And over Butter London’s Thames. So despite a few not so happies from my selection, I really am enjoying some of the new L.A. Colors. I think I will have to investigate some more polishes of theirs. I really like the dark blue glitter. I have to say that LA Colours are really good for their cheap price. 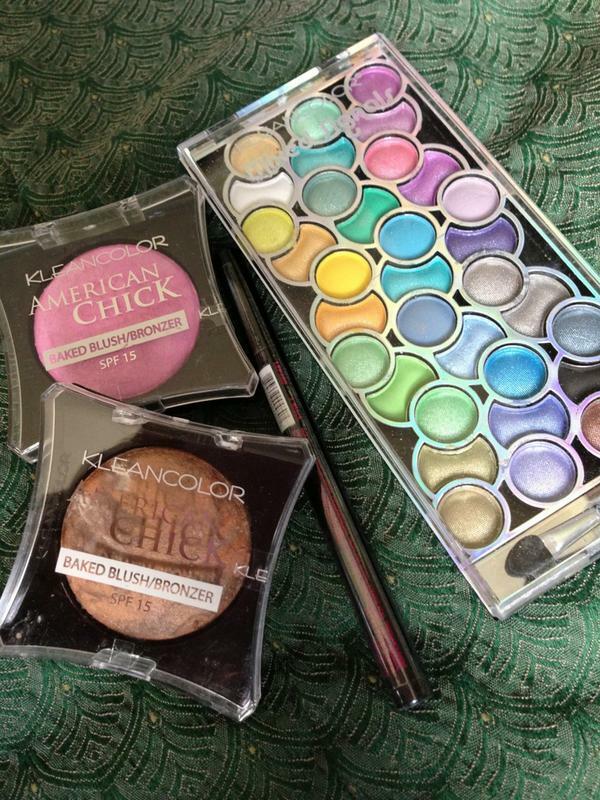 If you’re after cosmetics other than nail polish, I bought a Kleancolor eyeshadow palette and a blusher and bronzer a couple of weeks ago and they’re great. I use the eyeshadow for my eyebrows and it stays on ridiculously well until I apply a wet wipe! The blusher is also a really rare bright pink and I love it!